Have you tried to control boomy or harsh frequencies using a traditional static EQ but found you compromised the integrity of the original recording? Then found that writing automation lost you precious time and sounded unnatural? Perhaps you’ve heard that a multiband compressor is the answer but it left you scratching your head? 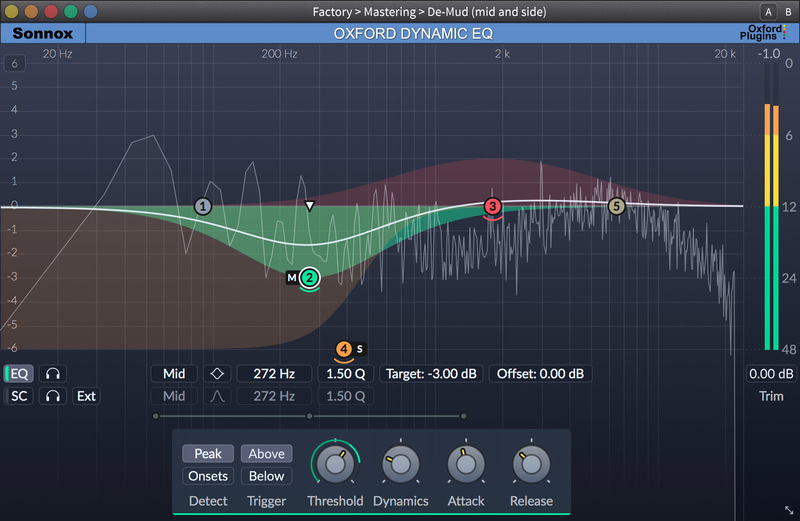 Then the Oxford Dynamic EQ is the tool you need, providing just the required amount of processing when you need it and takes little time to set up. 5 bands of the ultra-musical Type-3 EQ curve can be overlapped to bring unparalleled control and characteristic Sonnox transparency to your single sources, instrument groups and 2-bus alike. The Dynamic EQ introduces unique features such as the option to engage the effect by onset (transient) detection – very useful when working with drums and percussion. Additionally, mid-side processing can be used to enhance a vocal without affecting side-channel balance or to open up a mix by focusing low end energy in the centre. The highly-tweakable space-carving capabilities of the Dynamic EQ will be a welcome addition to your mixing arsenal. One of those plug-ins I can put into every project I've got going and make it sound better in seconds. This looks great - well laid out simple GUI. It sounds really open and smooth. Beautiful. Sounds really nice and is easy to use. Wow, an amazing plugin! The feature to set a band's sidechain frequency totally independently is the feature I was missing on all the other dynamic EQs which opens up many interesting possibilities. This is a great Plug-In. Sound-wise it's spectacular. There's something in the quality that gives a very natural outcome when correcting something very unnatural to begin with. It simply makes everything you run through it sound better - more 3D and with some air around it. "I’d expect nothing less from Sonnox but this Dynamic EQ really is a serious working tool that combines ease of operation with exceptional sound quality." "Oxford Dynamic EQ's GUI is the most elegant Sonnox representation ever, with controls that allow novice users to start getting sounds without opening the manual."